Alex Jordan (S ’08) is in his third year at The Bob Cole Conservatory at Cal State Long Beach. He sings in both the Chamber Choir and Men’s Chorus. He is currently in Once, a musical adaptation of the movie of the same name, and is the Choral Director for his chapter of Phi Mu Alpha, a music fraternity. In his “spare” time, he is the sound operator for the CSULB Jazz Choir, Pacific Standard Time, and sings in a local church choir. Alex and Owen McInnis (S ’10) are members of the band Uncommon Sense and will perform locally this summer. Their first CD “Uncommon Sense” is available on iTunes. You can follow them at http://www.facebook.com/theuncommonsenseband. Allie Glatt (NDB ’07): University of Denver, Theatre major, graduating 2011. Recent shows: Rent at City Lights in San Jose. Upcoming shows: Directing/Choreography Tick Tick Boom by Jonathan Larson for Senior Capstone Project. Angela Harrington (NDB ’03) teaches music at Albion H. Horrall School in San Mateo, sings with Opera San Jose and has been giving voice lessons to many current Tri-Schoolers. Chrissy Scannell (NDB, 2009): Stanford University, Human Biology major, Modern Languages minor. Received an early acceptance to Mount Sinai School of Medicine in New York City! Caitlin McGinty (NDB ’02): After three years of rave reviews in Beach Blanket Babylon Caitlin has taken the plunge and relocated to the Big Apple. Tri-school Productions says “break a leg” and knock ‘em dead, Caitlin! Carly Sisto(NDB ’05) graduated from Sacramento State in 2009 with her degree in Theatre. She is currently living in Sacramento finishing her last few months of cosmetology school at Paul Mitchell. She plans on pursuing her career as a theatre/film hair and makeup artist while spending her days creating magic for her guests in the salon. One of Carly’s upcoming projects will be directing the Summer Theatre Camp at Serra in June. Dawn Bailey (M ’06): Graduated from UC Santa Barbara with a major in Studio Art. She has done mission work in Mexico and Kenya. Dawn is currently an intern at St. Mary’s in West Harlem, NY, working for AmeriCorps through Episcopal Social Services at the Early Head Start Program in the Bronx, providing care to families with very young children. Emma Clark (NDB ’09): Georgetown University, School of Foreign Service, Culture and Politics major. Recently produced Arsenic and Old Lace and will appear as Johanna in Sweeney Todd: The Demon Barber of Fleet Street this month with Georgetown’s Mask and Bauble Dramatic Society. Ivy A. Henry (NDB ’04): UC Santa Cruz Theatre Arts 2008. Most recently seen in Rabbit Hole (Coastal Repertory Theatre) as Izzy. She has also recorded an audio book, Wax by Therese Ambrosi Smith, which is currently in post-production and will be on iTunes later this year. Ivy just relocated to Los Angeles to pursue her acting career. John Ballas (S ’07): Notre Dame de Namur University, Theatre Production, History major. Recently finished working on theatre senior thesis, directed a show called Gettysburg by Percy MacKaye in senior one act festival. 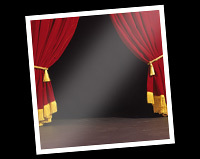 Recent shows include: A Christmas Carol the Gift (The Performance Company) Old Joe, Dancer. Light in the Piazza (Theatreworks of Silicon Valley) Technical Hassler. The House of Sweet Deception (NDNU Theatre) Light and Sound Designer, Assistant Stage Manager. This semester directing senior one act play, Gettysburg by Percy MacKaye, and will be the assistant production manager for Noises Off at NDNU Theatre. Joshua Marx (S ’04): In first year of being a part of the prestigious Mason Gross School of the Arts in New Jersey getting MFA in Acting. Currently in rehearsals for The Last Days of Judas Iscariot. Katherine Russell (NDB ’09): UCSB French major. Upcoming shows: Songs For A New World at the Granada Theater, and playing Mimi in RENT with Shrunken Heads Productions. Can’t wait for this year’s cabaret! Currently working on: Barnstorm (Student Production Company, UC Santa Cruz), Managing Director Photographs portraits, headshots, theatre production stills, and special events. Looking to expand portfolio if you need photos done. Also looking for theatrical work in the LA area. Maddie Jordan Taylor (NDB ’04): UC Santa Cruz Molecular, Cell, Developmental Biology ’08. Performed in Tri-School Cabarets ’09, ’10. Working as a research scientist in the biotech industry. Company: Ion Torrent, a Part of Life Technologies, in South San Francisco. Lives in Redwood City with husband (high-school sweetheart), Jeff Taylor, married August 14, 2010. See attached picture of Tri-School Productions alums and staff who attended the wedding. Patrick Duggan (S ’01): Loyola Marymount, BS Communications 2004. Living in Manhattan Beach CA – engaged with an 18 month old little girl. Currently working as a freelance writer primarily focused on video games. Ryan Svendsen (S ’06) who played trumpet in the pit for all of his four years at Serra, just landed a full time job with United Talent Agency. He will be assisting two Music Agents as well as scouting for new talent throughout the Los Angeles area and beyond. Thomas Gorrebeek (S ’00) continues to star in local theater productions, most recently in the South Bay premiere of Jeffery Hatcher’s Compleat Female Stage Beauty at City Lights Theater Company in San Jose. The Philadelphia Story was performed in Serra’s Gellert Auditorium October 31- November 7. Directed by Joe Hudelson (Serra, 1992), The Philadelphia Story is a 1939 American comic play by Philip Barry. It tells the story of a socialite whose wedding plans are complicated by the simultaneous arrival of her ex-husband and an attractive journalist. The play featured Barbara Del Castello (M) as Tracy Lord, James Giusti (S) as C.K. Dexter Haven, Taylor Sanders (M) as Dinah Lord, and Lucas Gust (S) as Macauley Connor. Other cast members were: Hilary De Witt (M), Marty Koenigs (S), Amanda Odasz (M), Joseph Scannell (S), Robert Cecchi (S), Julie Takla (NDB), Matthew Morrow (S), and Keegan Lindquist (NDB). Into the Woods will be performed at Hillbarn Theatre March 31-April 10. Directed and choreographed by Gennine Harrington, with music and lyrics by Stephen Sondheim and book by James Lapine, Into the Woods intertwines the plots of several Brothers Grimm fairy tales and follows them further to explore the consequences of the characters’ wishes and quests. The main characters are taken from the stories of Little Red Riding Hood, Jack and the Beanstalk, Rapunzel, and Cinderella, tied together by a more original story involving a baker and his wife and their quest to begin a family. The show will feature James Giusti (S) as Jack, Matt Elkins (S) as Baker, Chelle Denton (M) as Baker’s Wife, Taylor Sanders (M) as the Witch, and Danielle Philapil (M) as Cinderella. Reserved seating only in this smaller theater! Tickets are on sale now at www.trischoolproductions.com. This year’s Cabaret will be at St. Pius Elementary in Redwood City on June 18 and will have a different format featuring monologues and dances as well as songs. Any alum can submit a video audition to be considered. We’d love to have some folks from our Chicago, New York, and L.A. contingents so save the date and plan on spending some time back in your Tri-School home. To participate, send your audition video to Jay Jordan via email (jjordan@serrahs.com), Facebook link, or drop a DVD or flash drive at Serra for him. All submissions must be received by May 1, 2011. Tri-School Productions Alumni – stay in touch! Join our mailing list and our Facebook Group to receive information on future Tri-School Productions and TRISTARS events, as well as alumni news.